From its inception, Olympus has been designing and introducing revolutionary products in the speech-recognition industry. In 1969, Olympus introduced the world’s first microcassette recorder, the Pearlcorder S, and the company hasn’t looked back since. Olympus continues to be an industry leader in the development of speech-recognition solutions. Certified eSupport is your leading resource for the best technical support and services for Olympus products. Including the RecMic DR1200, the RecMic DR2200, and the RecMic 1200 ODMS Kit. These USB microphones all features trackballs for easy one-handed navigation, programmable buttons, and low noise directional microphones. Including the DS-2500, DM-720, WS-852, WS-853, WS-823, VP-10, VN-7200, and LS-P2 Digital Voice Recorder. 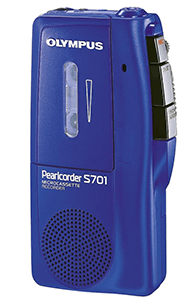 These powerful consumer recorders provide stereo quality recordings of dictations, conversations, music, and more. With the Tresmic three-microphone systems (the DM-620 and the DM-720), up to 8GB of internal memory, and easy-to-use interfaces, these voice recorders are suitable for consumers and professionals, alike. In verticals like journalism, field reporting, insurance, and sound production, Olympus offers these professional-quality voice recorders at a reasonable price. With Olympus speech-recognition enterprise solutions, large companies have access to the same high-quality speech-recognition devices that consumers and independent professionals have been using for years. 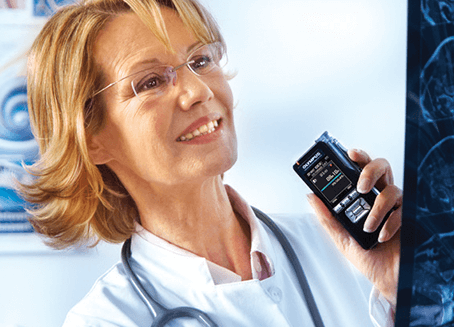 The DS-7000 offers 256-bit encryption, an independently housed microphone, enhanced battery life, and the Olympus Dictation Management System (ODMS). The DS-7000 is Dragon® certified so it’s ideal for medical and legal verticals as well as fully compatible with all Dragon speech-recognition software. The AS-7000 Transcription Kit also integrates the ODMS and is compatible with the DS-7000 and other Olympus professional digital voice recorders. Dictated files are automatically routed to predetermined locations and can be played back in multiple formats. It seamlessly integrates with Windows-based software for easy transcription that helps to streamline workflows and increase access to dictated documentation. Certified eSupport can also answer all your questions about the ODMS and the AS56 ODMS Administrators software, whether it’s the boxed version or cloud-based. The ODMS allows administrators to control and manage multiple users from one central location and oversee site license deployment. Olympus enterprise speech-recognition solutions are saving time and money for big businesses. Certified eSupport has a long-standing relationship with Olympus and over 40 years of experience in the field of business solutions. The technical expertise and guidance that Certified eSupport can offer you and your clients is unparalleled. With budget-friendly tiered support packages, you and your clients can choose the level of technical and support that is right for you. Whether it’s simply someone available to answer your questions at any time, day or night, or your clients need more comprehensive services, like installation, maintenance, and continuing technical support, Certified eSupport can do it.